Betfred have launched a completely new, user-friendly mobile casino, powered by IGT, with 8 popular games for in-browser play on iPhone, Android and other popular mobile handsets. Games include popular and tested classics like Cleopatra and Rainbow Riches slots, Roulette 3D, Blackjack, Monopoly Multiplier and more. To encourage you to test out these new games, Betfred is offering a free £5 instant bonus, which will be deposited into your account when you deposit and wager £5! The new Betfred Mobile Casino games are accessible through the slick new Betfred.mobi portal, which features integrated access to our improved Sportsbook and Goals Galore products where you'll find exclusive offers like Double Delight/Hat-Trick Heaven and all the superb value and bonuses that have become synonymous with the Betfred brand. With the new unified log-in for mobile sports and mobile casino, there's huge potential crossover revenues from for seasoned gamers having a punt on Sportsbook and dyed in the wool punters trying their luck in our Casino! You can directly go to Betfred.mobi or continue to use your current Betfred.com link, since players who visit Betfred.com from a mobile device will be automatically redirected to Betfred.mobi. How to playText CASINO to 89660 to play these games, or visit https://betfred.mobi/casino on your mobile. Texts will cost your standard network rate. Existing customers can login using their normal details, while new customers will need to register an account to play. Can I create an account with Betfred Mobile? Yes you can register your account through Betfred Mobile . You can then use this one account to bet with us over the phone, internet and your mobile phone. Can I use Betfred Mobile abroad? Yes. You may need to activate roaming on your mobile account, which usually incurs charges from your network provider. Please Contact your Mobile Network Operator for details. The service is provided FREE of charge by Betfred. There may be a network charge or a DATA charge from your network operator. Many contract users now have 'unlimited internet/data' included, in this instance there are no charges outside of your standard contract. Networks charge different rates for the use of WAP services or to send and receive data on your mobile. To find out what your network provider charges please contact your network provider or visit their website. Pay As You Go users might find that different network providers may charge a small fee to access the internet or WAP sites just as they do for games and wallpapers. Again, please contact your network provider if you wish to find out their latest rates. What do I need to bet with Betfred Mobile? An account with Betfred.com . You can log-in with existing details, or register as a new user via your handset. What happens if I lose my connection whilst using Betfred Mobile? If you lose connection to the service you will be notified of this and instructed on how to reconnect. 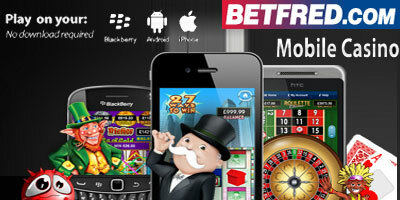 "Betfred Casino Games available on Mobile (iPhone, Blackberry, Android)"